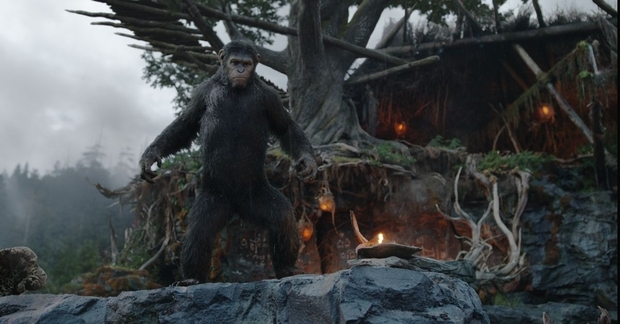 Weta Digital’s extraordinary performance-capture work on Dawn of the Planet of the Apes grabbed five VES noms along with Disney’s Big Hero 6 and Laika’s The Boxtrolls. The VES Awards will be held on Feb. 4th at the Beverly Hilton Hotel. Apes will go head to head for the top award with Interstellar (four noms), The Hobbit: The Battle of the Five Armies (four noms), Guardians of the Galaxy (two noms), Maleficent (two noms), and X-Men: Days of Future Past. Big Hero 6 and The Boxtrolls will compete for the top animation prize with DreamWorks’ How to Train Your Dragon 2 (four noms), The Lego Movie (two noms), and Rio 2 (two noms). The best supporting VFX nominees are Birdman, Divergent, The Grand Budapest Hotel, The Imitation Game, and Unbroken. While Guardian’s Rocket was nominated for animated character along rivals Caesar and Koba from Apes, the popular Groot was edged out by Maleficent’s Thistlewit. Competing for animated character on the animation side were Baymax, Hiccup, and Rio 2′s Gabi. As previously announced, the Visionary Award will be presented to J.J. Abrams (Star Wars: The Force Awakens). However, Ridley Scott will not be presented with the Lifetime Achievement Award due to his busy production schedule shooting The Martian.